1. Jase is now 6 weeks old. He is still living with us. BTW, he loves the beach, the Braves, NBA Playoffs, and LSU. Late every night when I’m changing his diaper and feeding him his bottle, I quote Matthew 25:37-40. We’re still praying for a family to adopt him. 2. 70 people have crashed the waters of baptism at Graystone Church in the first 5 months of 2013. PRAISE GOD! I call that a REVIVAL! If you are ready to go public with you faith, you can sign up for baptism online here. 3. You will be blown away when you see the new basketball court at Graystone Church. It is the nicest outdoor basketball court I have ever seen. And our guys got it ready just in time for Sports Camp. A big THANK YOU goes out to the men who installed 6 basketball goals until 1:00AM Wednesday night. We have a church full of servant leaders. The courts will not only be great for Sports Camp but for youth team practices and just a safe place for kids (and adults) in our community to come play basketball. THANK YOU to everyone who gave to the 2012 End of the Year Offering to provide this basketball court for our kids and community. God is good! 4. 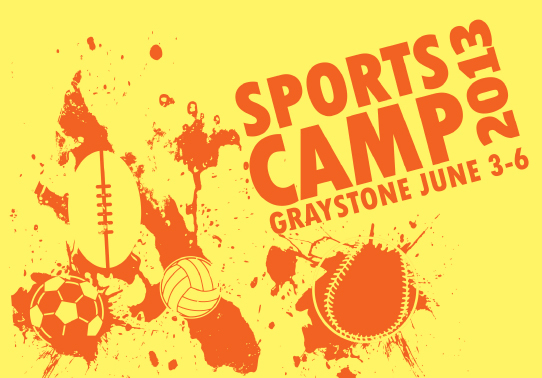 Sports Camp is next week. It’s one of the greatest weeks of the year at Graystone. If you want to volunteer, just show up one night M-TH around 6:00PM. If you still haven’t signed your child up, you can do it online here. 5. Graystone’s Annual Man Series begins on Father’s Day, June 16. I will be sharing a 3 week message series based on the life of Samson from the Old Testament. We’ve already started our planning and preparation. In fact, several of the staff guys and men from the church are shooting automatic weapons and blowing things up as I write this blog. I was bummed that I could NOT make it out for all the fun today. Hopefully, they will all come back in one piece. I think we are having a promo video this Sunday.